Chengdu, the capital of Sichuan Province, lies in the hinterland of the Chengdu Plain, in central Sichuan. Chengdu enjoys a long history. 2,500 years ago, Kaiming IX, king of ancient Shu in the Zhou Dynasty, started to set up the capital in Chengdu. "A town was built in this area in the first year and the capital in the second year, so the ancestor named the city as Chengdu, which means to become a capital. Later on, Chengdu gradually became one of the most important centers of politics, economy and culture in China. In the Five Kingdoms Period (907-960), Mengchang, king of the Houshu Kingdom, decreed to plant hibiscuses on the protective wall of the city, so Chengdu was also called the City of Hibiscus. 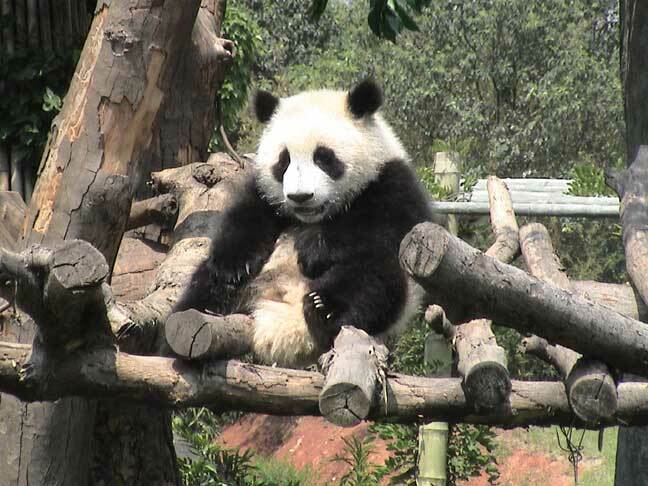 As one of China's famous historical and cultural cities, Chengdu enjoys rich tourist resources. 15,500 years ago, a well-known poet in the Jin Kingdom, Zuo Si extolled Chengdu as lofty and pretty. This city has also gained the eulogium by both Li Bai, the poet immortal and Du Fu, the poet sage. With rich cultural heritage and beautiful scenic spots, Chengdu is a peaceful and prosperous city. A Baby Panda greets our group at the Giant Panda Research Base near Chengdu. Baby Panda on a comfortable tree perch. Daoist group on the way to opening ceremonies of the International Daoist Conference held near Chengdu in 2004. A beautiful Pavillion at the famous Green Sheep Temple in Chengdu. The Sichuan Opera provides amazing entertainment with varied performances including an incredible mask changing show. Colorful costumes at the Sichuan Opera in Chengdu.